I live for the holidays! I love to get away, whether to explore somewhere new or revisit an old favourite, holidays are for us, quality family time together. We have been taking Lachlan on holiday since he was 7 weeks old, we have stayed in youth hostels, hotels and self catering. We have traveled as far North as Inverness and as far South as Windsor, we have never been brave enough to travel any other way than car but we hope to in the future get to Euro Disney so ferry or flying will be a must. I have to say that taking Lachlan anywhere over night or longer, is a military operation, involving careful planning, checking and double checking. Due to Lachlan’s dietary needs we have to take all the food he will need with us, as there is never any garuntee the local shops will sell oat milk, dairy, egg, gluten and soya free snacks or toddler meals. Can you imagine what 3 meals a day, plus snacks, juice and milk look like? Lachlan is still in nappies, so a big enough supply of them has to come too, we never manage to go through just one set of clothes a day, in fact getting away with just three changes in a day is usually good going, the big buggy, chewies, medication, some toys, iPad, cups, plates and cutlery. I have also found it very helpful to carry with us Lachlan’s Autism Report, Coordinated support plan, DLA entitlement letter and my carers allowance letter, these documents are the proof required at entry points to attractions to receive any possible discount on ticket prices, sadly due to others abusing the system they are also the key to gaining the passes which allow disabled children and carers to access rides via the exit points at theme parks. Most importantly of all these documents are vital in the event of having to access medical assistance, firstly because they give detailed information on Lachlan’s disabilities and needs but also because they carry the contact details of the professionals who know Lachlan well and who’s advice may need to be sought. That is everything Lachlan needs. We have to fit all this in the car, along with ours and the older two’s luggage. Before we even get to the packing though, I will have called where we are planning to stay to make sure everything is in place. I check where we are planning to stay has WiFi, any length of time without internet access for Lachlan is unbearable, when in unfamiliar surroundings the iPad is Lachlan’s best coping strategy, he can watch his favourites via the iPlayer or Love film, play his much loved apps or access his favourite websites, all are familiar and reassuring to Lachlan. A microwave is a must for making ready brek, a bath as Lachlan is terrified of showers, enough beds that Lachlan can share with Ian or myself and preferably Alex and Hamish in separate rooms, I usually end up sharing a room with Hamish and lastly enough indoor and outdoor space to give Lachlan the freedom to move when sensory seeking! I will always look for somewhere set well back from any main roads, not too close to any rivers or open water, Lachlan has a passion and dangerous fascination with water. I will have double checked the local amenities, to see there is what we might need to hand and how to access help should we need too, especialy in terms of GP and out of hours cover. All the planning is worth it though, as once we are away, everything stops! All the appointments, meetings, phone calls, decision making, pressure and stress all stop! For me even just a break from having to think about everything constantly is magical. For a week if we are lucky two we are just like any other family enjoying time away together, all three of my children benefit hugely from having thier parents relaxed, happy and available to only them. Lachlan loves being away, I am led to believe this is a little unusual for a child on the Autistic spectrum, I am certain it has a lot to do with the fact that each year our main break away is to the same location and we visit the same attractions we visited that very first time we took Lachlan away. Lachlan associates days out and holidays as fun and exciting, we always think carefully before taking Lachlan anywhere about what he will get from the experience. Last month we headed South to the Peak District, we stayed in a lovely self catering cottage just outside Ashborne. We had an amazing week, I am not sure even Disney could match the magic. We drove down on the Friday and it was gone 7.30pm by the time we found our cottage, three bedrooms, kitchen and lounge area, the master bedroom had a beautiful four poster bed, the other two rooms both doubles, our intention was that Lachlan would share with his older brother, Lachlan shares our room at home so we hoping for a break from our 4.00am bed visitor. I never did get to spend the night in the four poster bed, Lachlan was having none of it and he ended up sharing the four poster with Ian and I ended up sharing a room with my older son, not quite what I had mind but not a battle worth fighting either. We visited the local town on the Saturday, Ashborne is a market town with lots of lovely little shops and pubs, the locals were very welcoming and friendly. In the afternoon we visited Duffield railway and all enjoyed a ride in Iris the diesel Locomotive, Lachlan sat at the front with Hamish and loved when Iris chased pheasants off the track. On the Sunday we took a drive to Twycross Zoo, Lachlan loves animals, he loves to watch them and will spend ages at an enclosure especialy if it is home to one of Lachlan’s favourites, those being penguins, elephants, big cats and the larger monkey species. Twycross, is home to Humboldt Penguins, Snow Leopards, Elephants and they specialise in monkeys, the enclosures were beautifully designed so much so Lachlan could really see all these animals close up. Lachlan loved watching the Penguins antics both above and below the water and we were splashed by an elephant much to Lachlan’s amusement, much to our horror Lachlan tried very hard to get in beside the elephants! We all enjoyed our day at Twycoss. That night we ate out in the local pub in Ashborne aptly named George and The Dragon, Lachlan coped so well and sat long enough, with help from the iPad for us all to eat a meal. On Monday we spent the day at Alton Towers. This was meant at to be the highlight of our holiday, the day got of to a bad start with Lachlan going into meltdown, the poor wee chap was heartbroken and hysterical, we couldn’t console him at all, I honestly thought we were going to have to abandon the park and I was standing their torn between doing what was right for Lachlan and not spoiling a much longed for outing to Alton Towers by my older two children, knowing how devastated they would have been had we had to leave. We decided to see if a shot on one of the rides in CBeebies Land wouldn’t help calm Lachlan down, so we headed for the “In The Night Garden” boat ride. Thankfully our day out was saved, Lachlan settled quickly and loved seeing all his Cbeebies favourites. 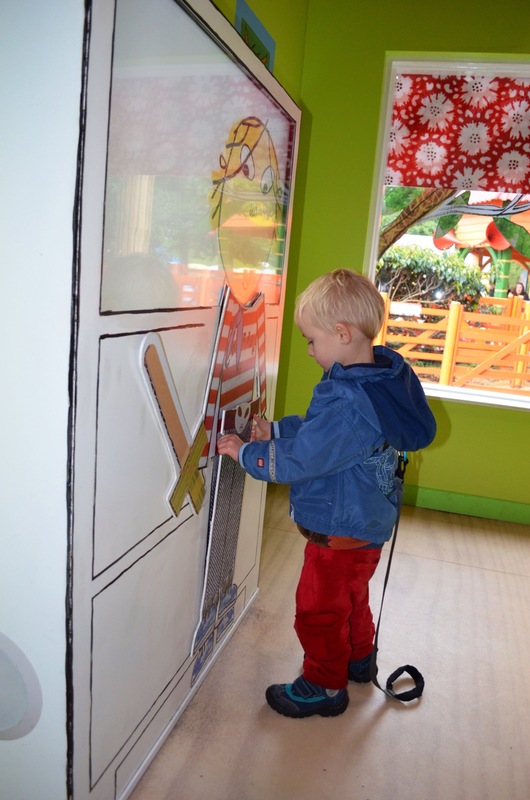 Lachlan loved the rides and activities, his favourites were the Postman Pat van ride, the Zingzilas stage show and Charlie and Lola’s house. Staff at Alton Towers were very understanding and helpful, my only criticism is the amount of loud music they have playing, different theme tunes but as the rides are so close together is just a noise. On Tuesday we visited the National Tram Museum in Crich, we were not expecting much but were impressed. 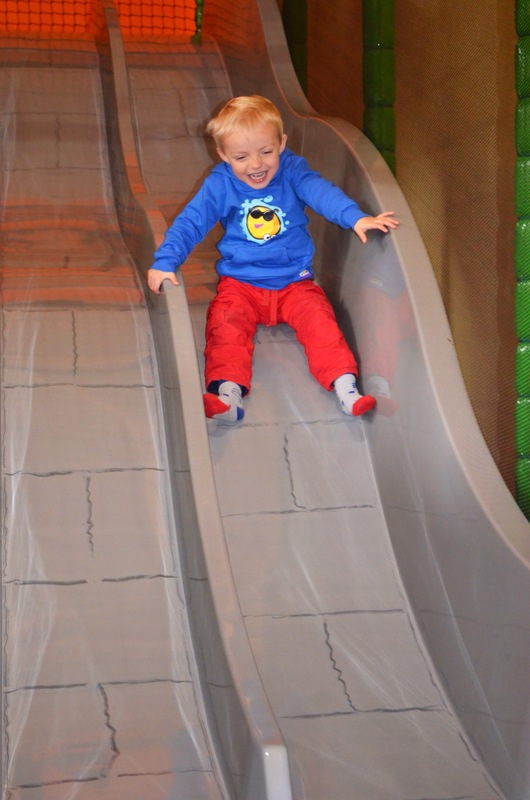 It was a great family day out, all three children enjoyed wandering round the museum and rides on the old trams, they had a brilliant soft play which meant we could allow Lachlan some much needed freedom to explore and play. Wednesday was our other surprise for Lachlan, though after his initial reaction to Alton Towers I was not so sure how we were going to get on. 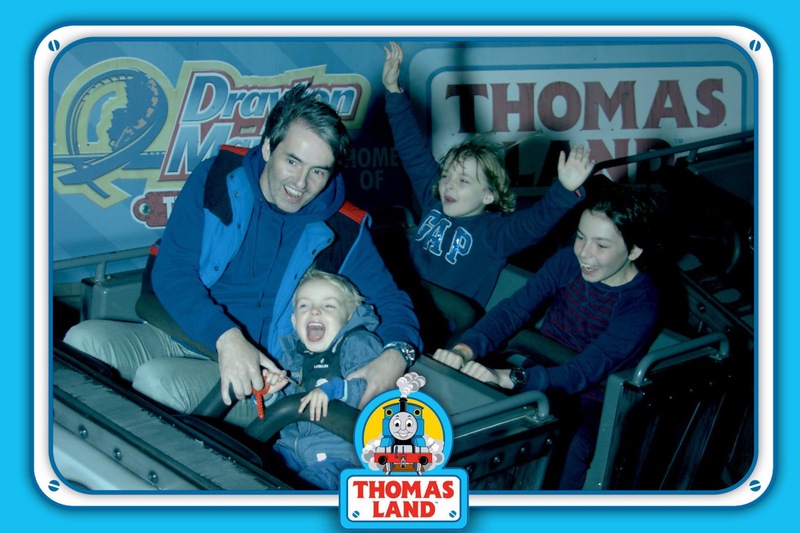 We headed to Drayton Manor, home to Thomas Land. 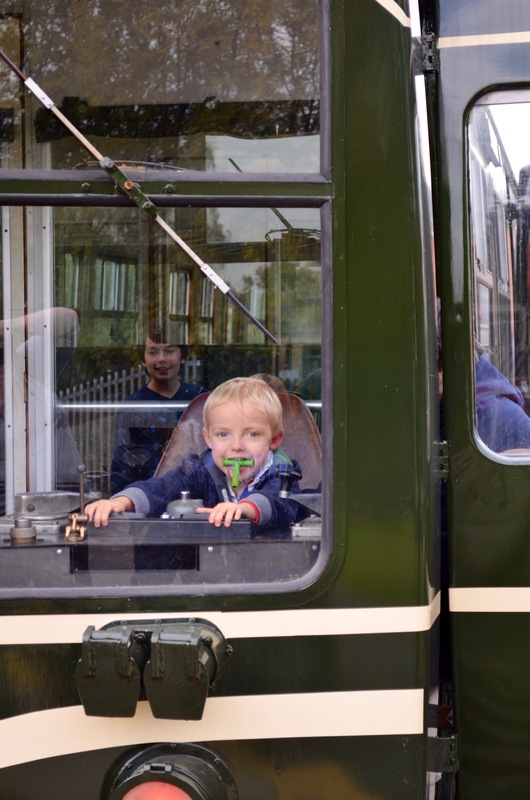 I think it is fair to say this was the happiest and most magical day out we have ever had as a family, I always have had a special affection for a little blue engine and dark red bus from my own childhood, but for Lachlan the day was truly magical. 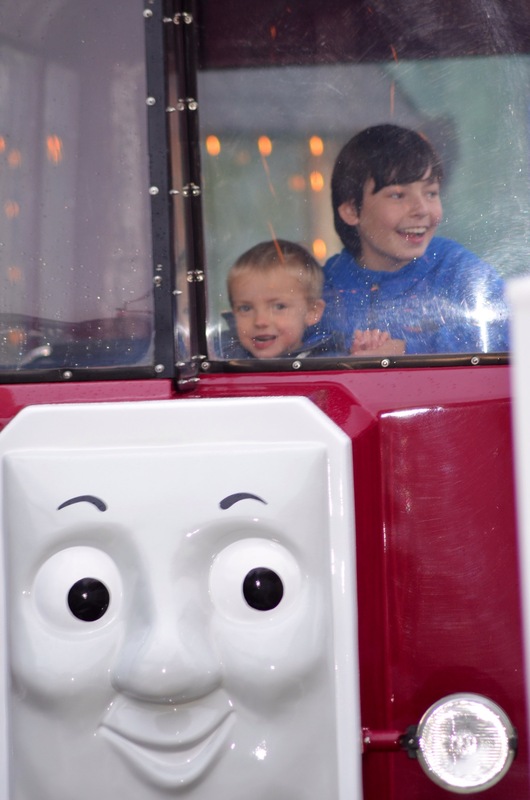 I was touched and proud of Hamish and Alex that day too as they happily gave up time in the main park to give Lachlan more time in Thomas land, they willingly took turns on rides with Lachlan. Lachlan loved it all, the trains, the troublesome trucks rollercoaster, Harold the helicopter ride, all of it was so brilliantly put together, the staff were understanding and helpful, at the end of the day the chap manning the Bertie Bus ride Lachlan was really taken with, let the boys just stay on and switched the ride over to always on, so the boys didn’t have to get off between goes, Lachlan was heartbroken when it was time to leave. We have promised to go back again hopefuly next year. If you show Lachlan photos from that day he will tell you “Thomas Land” and even now a month on Lachlan’s eyes still light up. Thursday we visited The Heights of Abraham in Matlock Bath, we rode on the scariest cable car, so much so I walked the two miles back to the base station! The views were stunning from the top, the Peak District really is beautiful. We all took a trip down an old lead mine, which Lachlan happily enjoyed, I found it unnerving, heights and confined spaces are not my favourite things. Ian and the kids enjoyed the cable car back down. Friday was our day to leave, we decided that as it was not too far that on the way home we would visit Chester Zoo and stay over night in Warrington. Chester zoo was outstanding. 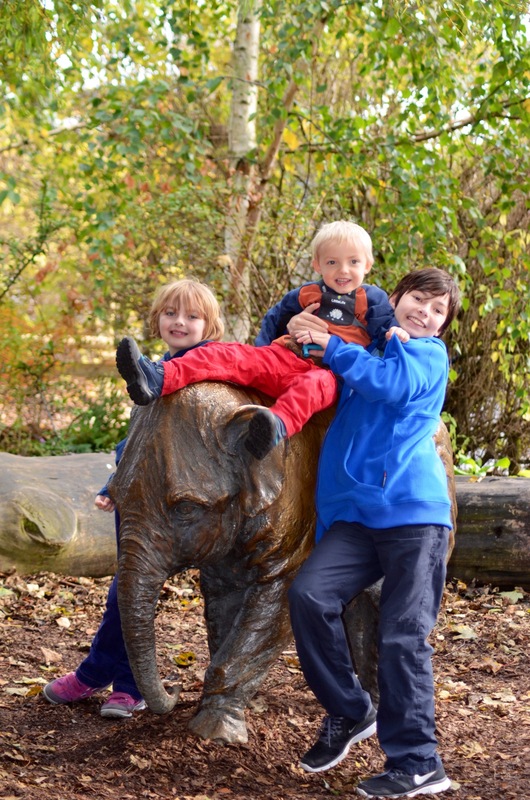 We all enjoyed our day there, Lachlan loved the animals, it was the first time he had ever seen a giraffe, a spectacled bear, lions and rhinos. The enclosures at Chester were everything I had hoped and more, Lachlan was able to see all the animals so closely and clearly, he laughed when the lion roared and the spectacled bear climbed her tree, his favourites as always were the penguins. Lachlan has been happy to show his playgroup photos from our time away and amazingly has even managed to say a few words about the photos. All the planning and effort was really worth it. → Jingle Bells, How far we have come….